AIT provides unique integration capabilities via stored procesures you can call from eConnect. These procedures can be called to handle all of the complexity that accomanies creating an AIT Journal Entry. – Due From/Due To accounts are assigned automatically, so you can leave them empty. Use this procedure to create a header record for an AIT Journal Entry. If you don’t need to do this, the itwsGLSaveAITDistribution procedure will automatically create a header. Use this procedure to create distribution records. When creating distributions, include only the ultimate distribution and do not try to create any GP distributions, such as non-intercompany or the due from/due to distributions: the stored procedure will take care of that for you. Always assign a default value to each parameter: never use a null value. If using eConnect, use this procedure instead of the GP procedure. 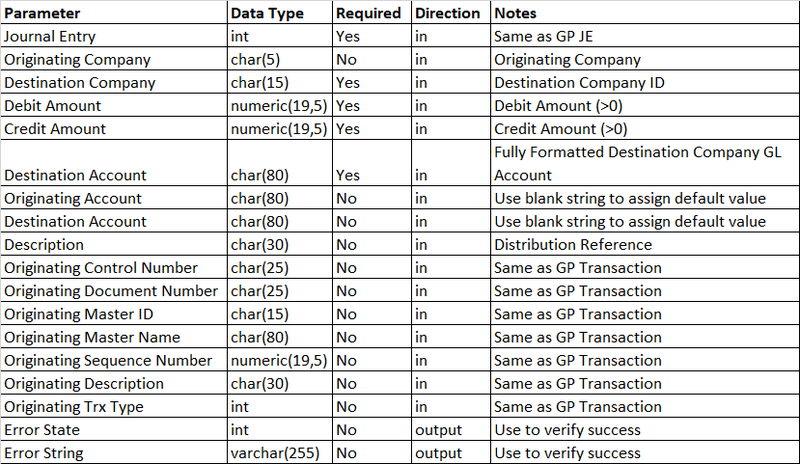 You will need to create the GP Header record before creating any distribution rows in order to assure data integrity and proper calculation of transaction details.